If for some crazy reason you prefer being warm and cozy over cold and miserable then Mysterioso M-Tech is what youre looking for. Made from Polartec 4-Way Power Stretch, the inside is soft and fleecy, the outside is tightly knit, non-piling and provides warmth and wind resistance even without a shell. The Power Stretch M-Tech will provide superior insulation wet or dry and should be used as a base layer alone, under a wetsuit, or under a shell. 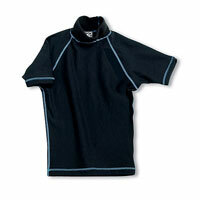 The TSS Short Sleeve Crew makes the perfect layer for under dry tops, dry suits and wetsuits.